I started back to work formally on Tuesday, and immediately got sucked into the vortex. I could feel it. Tuesday started with a last-minute meeting that ended with, "and there's another meeting you need to be at on Thursday morning." I spent most of the day yesterday writing the next exam for the summer group, who go until October actually. So the summer-fall group. I woke up at 3:30 this morning, and couldn't get back to sleep, so here I am. I will go in to work soon and get stuff done before the meeting I have to go to. I saw a meme thing about all the places you have lived, so I thought I would do that too. A leftover turtle picture from last week. One area of the creek is now covered with algae, thanks to the heat. 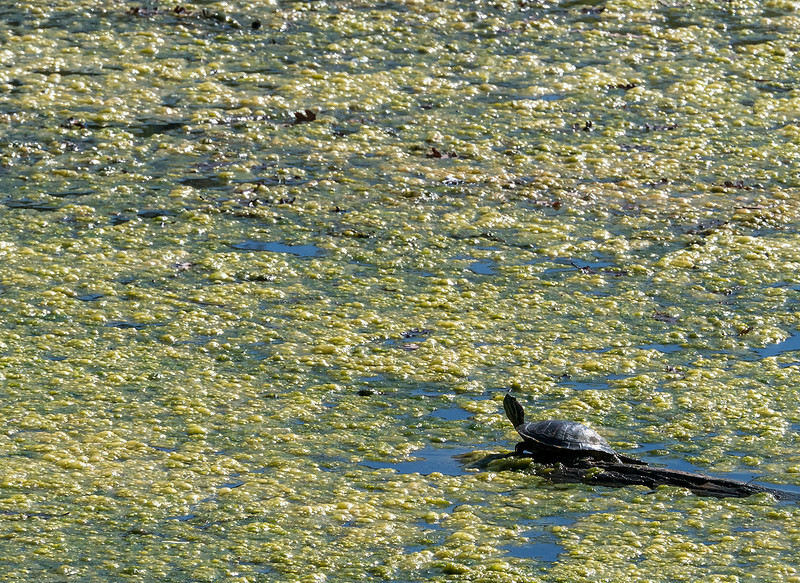 I saw another turtle emerge covered in it. He looked like a green Cousin It. The other thing about this picture was that someone here had been talking about the use of negative space in photos, and I am susceptible to those type of suggestions. It's one of the things I love about looking at people's photographs here--they inspire me.